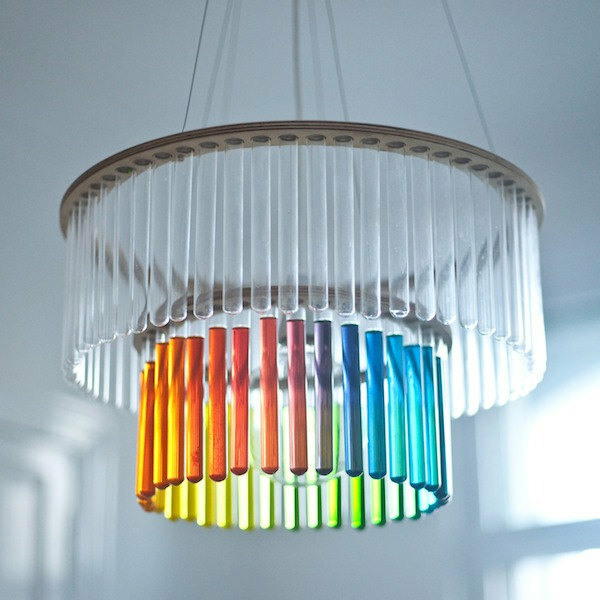 Polish designer Pani Jurek brought test tube chandeliers to prominiscence with her Maria S.C. design which she sells through Etsy. 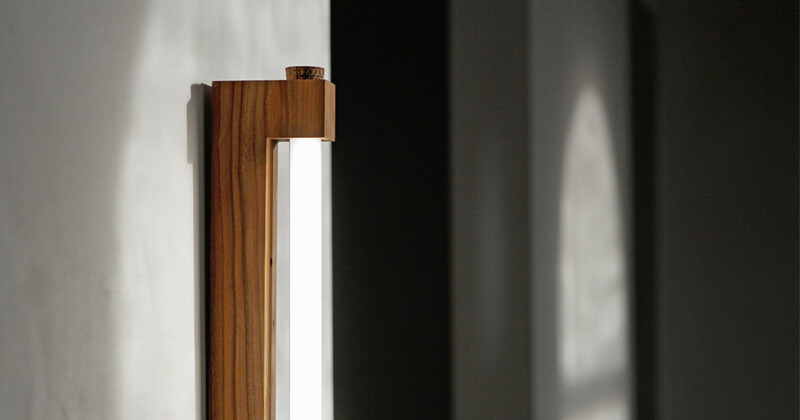 These versatile chemistry-inspired lamp shades feature test tubes which rest in holes drilled around a plywood ring. The glass tubes can then be filled with a variety of different decorative things such as coloured water, pebbles or flowers. 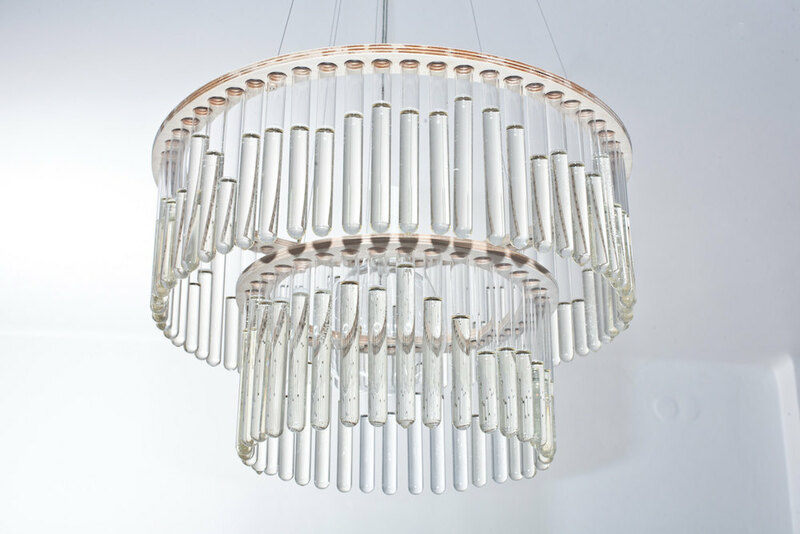 Pani Jurek was inspired by the double Nobel Prize winning scientist Marie Curie and entitled her test tube chandelier ‘Maria S.C.’ after the Polish scientist’s original – but less well known – name Maria Skłodowska-Curie. 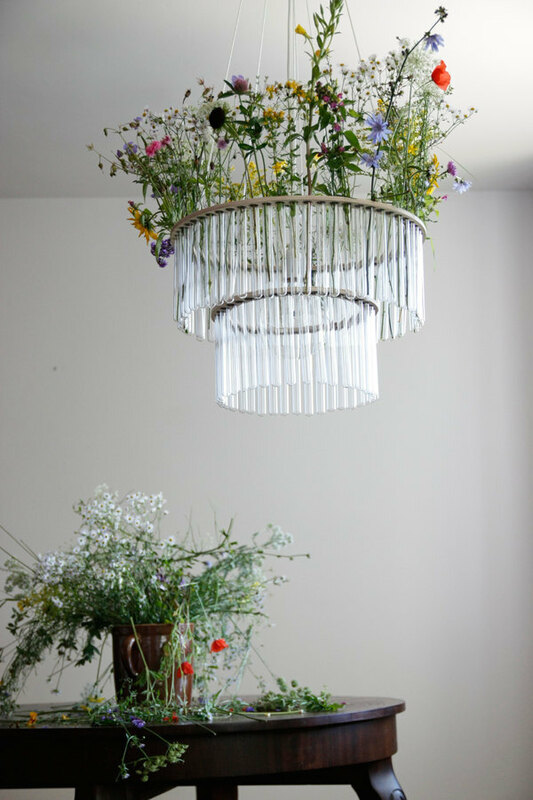 As mentioned her chandeliers are available to buy through Etsy – although we’ll also be looking at how you could make your own DIY version in this article. 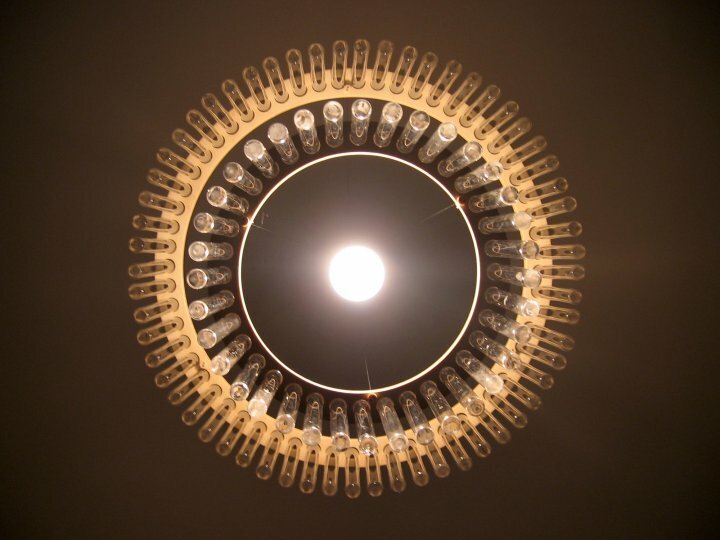 Through Etsy you can order a chandelier with a single ring of test tubes for $215 or a double tiered version for $260 which are both shipped from Poland. 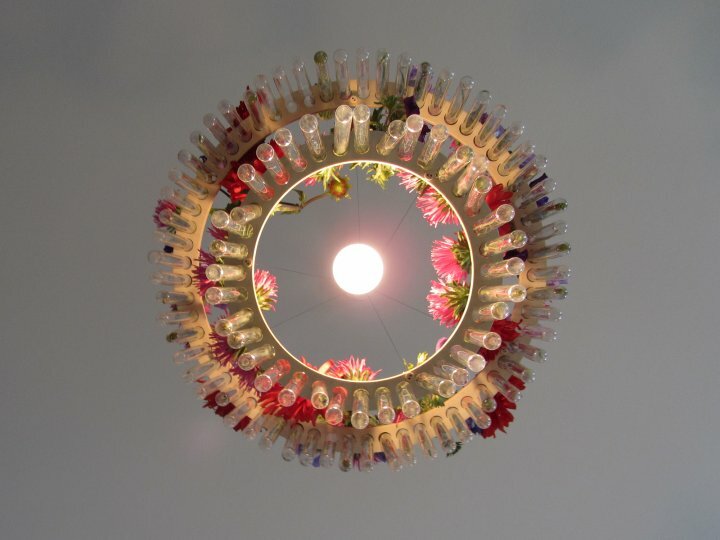 Lamps shades and chandeliers essentially serve as the centrepieces in rooms but aren’t often altered or personalised. 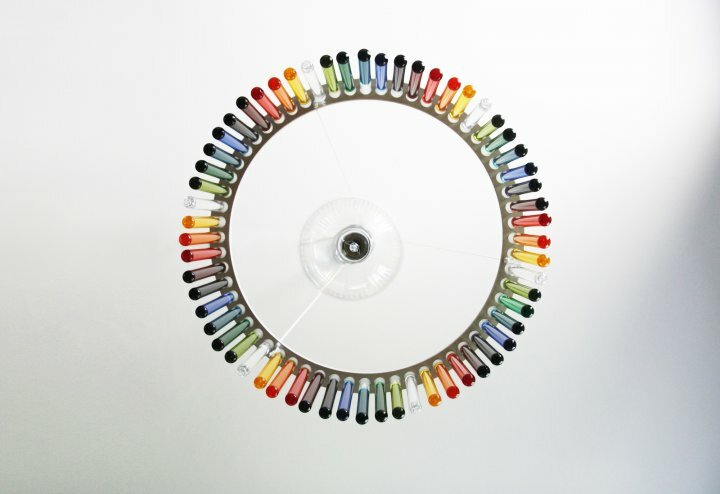 Test tube chandeliers on the other hand can be changed to suit your mood, the season, or new interior design styles by incorporating different decorative features within their glass tubes. 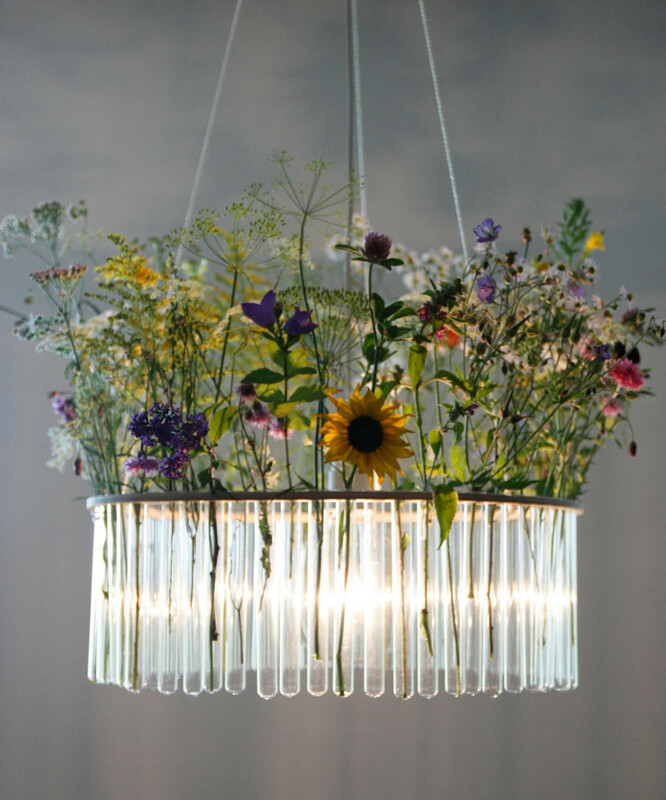 Decorating your test tube chandelier tends to primarily revolve around the tube’s capacity to hold water which allows it to play host to flowers in a similar way to a single stem vase. 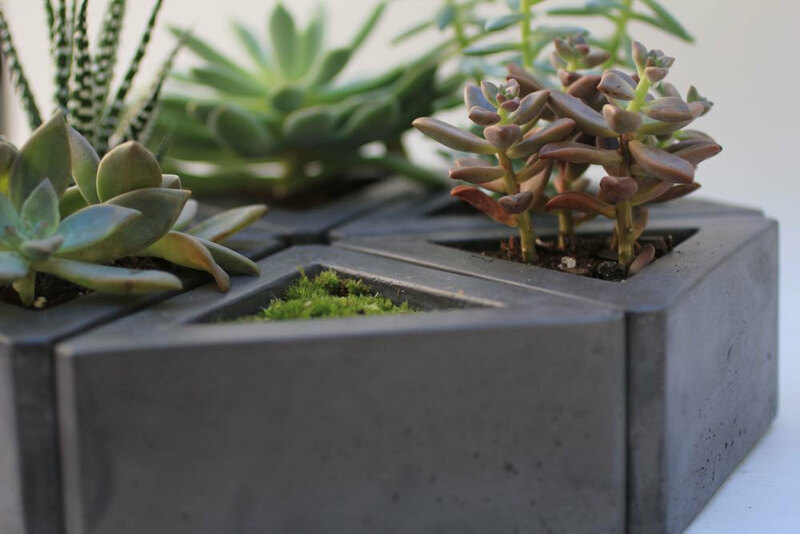 The water can also be coloured using dyes to form rainbow spectrums, the warm hues of autumn or various shades of a particular colour to match a room’s colour scheme. Simple food or powdered dyes can be used for colouring the water by mixing varying quantities of the primary colours to create a colour wheel. 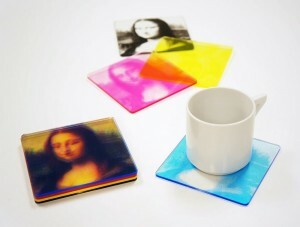 However if you’re hoping to create a vibrant set of colours, as opposed to what are commonly referred to as ‘mud’ colours, I’d strongly suggest incorporating the true primary colours: cyan, magenta and yellow, as opposed to the commonly held but false primary colours red, yellow and blue. This brilliant article clearly demonstrates the reasoning behind this and will surely change the way you look at colours henceforth. 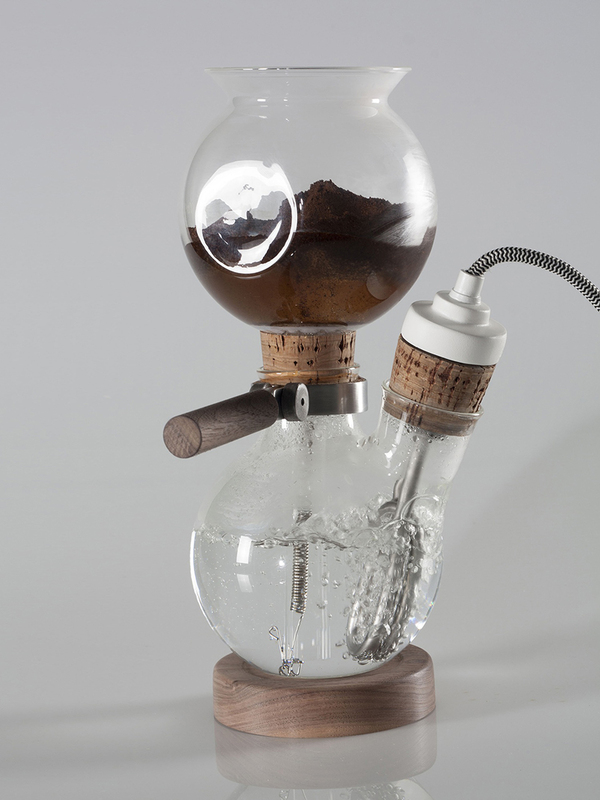 There is of course the obvious issue of the coloured water evaporating over time, and also of mould taking hold on the wood and glass. My suggestion to combat these nuisances would be to mix in small quantities of ethanol (pure alcohol) with your coloured water to kill off bacteria, as well as stoppering the tubes with simple corks to drastically slow the effects of evaporation. 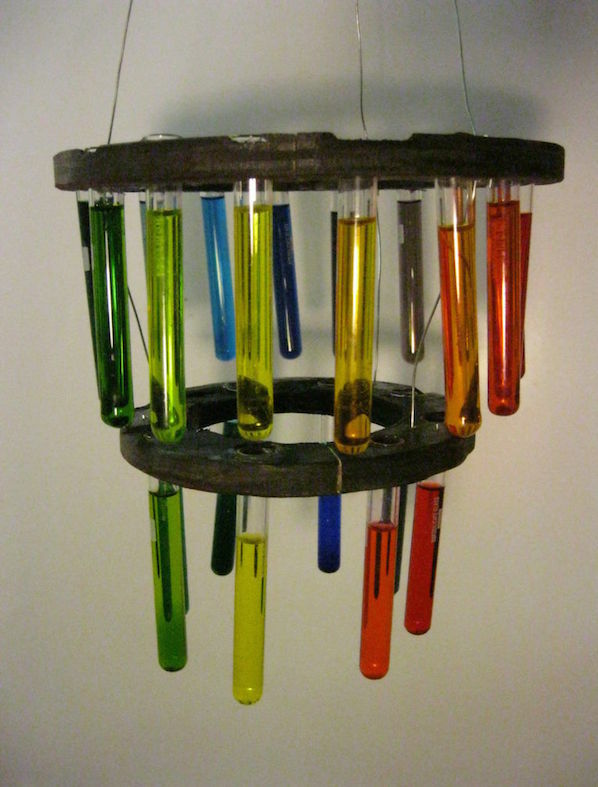 Instructables user LostRite posted this guide for making your own DIY test tube chandelier although the end result certainly doesn’t look as refined as Pani Jurek’s brilliantly made Maria S.C. version. However the writer of the guide seems to have been going for a more rustic feel with his test tube chandelier by opting for dark stained hardwood as opposed to plywood, and by incorporating far fewer test tubes into the chandelier which are arranged at jaunty angles. The writer of the Instructables guide also mentioned having difficulty in mixing a vibrant purple colour, so if you happen to be reading this try mixing cyan and magenta! 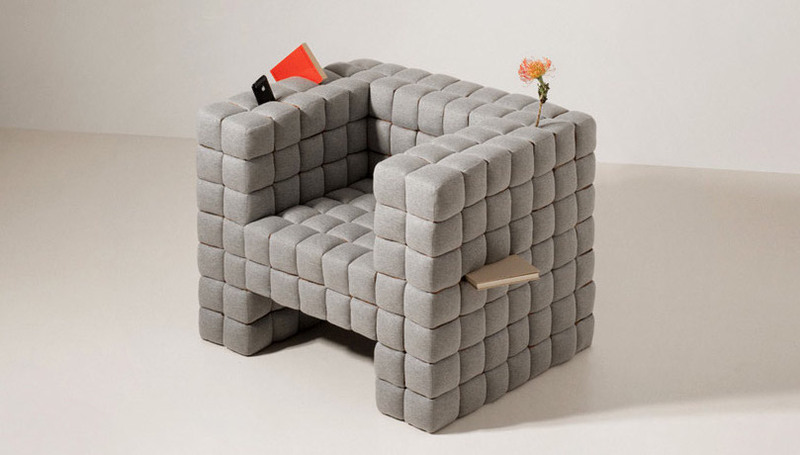 I think it would be possible to emulate the Maria S.C. plywood versions if you’re looking for a DIY project, have a decent set of power tools to hand, and are prepared to be meticulous with the details. However if this doesn’t sound like your idea of fun then head over to the Pani Jurek Etsy shop and buy one of hers direct. 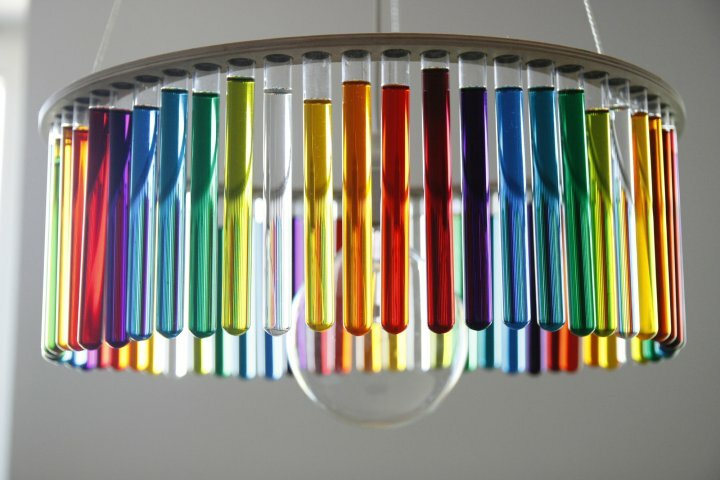 Her test tube chandeliers come complete with the glass tubes so perhaps aren’t as expensive as they might look at first glance.